Submitted by chadm on Sun, 2016-05-15 13:09. My previous post was about enabling auto screen rotation in Ubuntu and today we'll extend that to add a rotation lock function. Step 1 is including checks to a locking file. I chose to create a hidden file in my home folder. All you have to do is replace the case section in the previous script with what I listed below. Submitted by chadm on Sat, 2016-05-07 14:30. I starting using a Dell XPS 12 (the one with the ferris wheel screen) at the end of last year and love it, however it was annoying that auto rotation wasn't working when I was in tablet mode. At first I created some keyboard shortcuts to do it quickly when I needed to, but still remained annoyed. After a while I finally set out to do something about it. Fortunately there is a package already in Ubuntu called iio-sensor-proxy and it is capable of monitoring for orientation changes. If you are a Gnome user it's all you need because they have added auto rotation support to the settings, however if you use Unity then it still won't work. The solution is a script that uses iio-sensor-proxy to monitor and trigger the rotation instead of doing it by hand. Submitted by chadm on Fri, 2011-08-05 08:00. I had a need to merge 15 mp4 files recently and a simple tool for the job is Avidemux. Just open the first file and select Append from the File menu to select the next one. Repeat until all of your files have been added. The default encoding settings are copy for both video and audio so you shouldn't have to make any changes before saving the new file. As with any encoding job it's always a good idea to test the output file. I have a new phone and for some reason the audio was getting messed up after the first clip. I've never experienced that problem in the past. Submitted by chadm on Mon, 2011-05-02 08:22. With the recent launch Ubuntu 11.04 (Natty Narwhal) I have added a links for those versions to any app contained in the natty repositories. I also fixed a few bugs so every app should now have up to date versions and links for each of the distributions tracked on Linux App Finder. Submitted by chadm on Wed, 2010-09-08 13:05. I recently purchased a Samsung Galaxy S (the Captivate version) and I naturally wanted to be able to transfer files between it and my Linux desktop. I'm using KDE 4.5 on Kubuntu 10.04, but there are probably ways to do this using Gnome as well. Initially I used a USB cable and configured the phone as a Mass Storage Device, but then I got to thinking that there had to be a way to use WiFi instead. Especially since I didn't keep a compatible USB cable at my main computer. After a little searching I came a across a great app called SwiFTP. SwiFTP is a nifty FTP server that's very easy to use, but will need some basic setup the first time you use it. There is a prominent Setup button and pressing it allows you to enter a username and password. Do that, press Save, and you'll go back to the main page. Touch Start and you're in business. You'll see a WiFi URL listed that you'll need for the next step. Submitted by chadm on Wed, 2010-06-09 14:47. TestDisk is a great tool for recovering files from a broken disk. My wife's hard drive crashed yesterday and it turned out to be a corrupt boot sector. I booted to a Kubuntu Live USB and was able to use TestDisk to recover the MBR from the backup (it was NTFS which keeps a backup at a different part of the drive) and copy the files I needed to a USB key. It has a command line interface, but you simply run "sudo testdisk" and there is a guided menu based approach after that. If you are having any hard drive issues it's a good first place to start. Submitted by chadm on Sun, 2010-01-10 17:32. A few long overdue updates to the Linux App Finder database are in process. I finally added support for the GetDeb apps and games repositories. These are some very useful repositories because you can often find deb files for apps in them that aren't yet in Debian or Ubuntu. They also could be used to get more recent versions of some programs than you might find elsewhere. All of the apps in GetDeb are not yet in Linux App Finder, but at least those that are will be reflected in the available files. Debian Squeeze will be the next Debian release and is the current testing version. All of the official Debian squeeze repos will be updated. I also included the squeeze section of the Opera repository. Submitted by chadm on Wed, 2009-08-05 08:53. I have preschool aged kids who like to play games so I'm always looking around to try new ones. One game we've been playing for a while is SuperTux. SuperTux is styled after the classic Super Mario Bros games and features their classic sidescrolling action. In place of Mario the star character is Tux, the Linux penguin mascot. There are 26 playable levels in the main game and some additional bonus levels for additional fun. 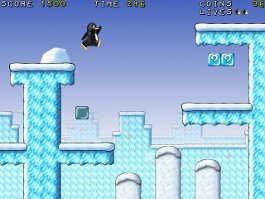 SuperTux even has a level editor that you can use to create your own. Submitted by chadm on Sun, 2009-07-26 06:31. Ubuntu's Karmic Koala repositories have now been added. I haven't run a complete database update because it takes ages, but any new or updated apps will have the latest links. Install Now will work regardless of what is shown on the screen because it looks for what is in your local repositories. Medibuntu's Karmic repositories have also been added.